The netbook case is finally done! My husband and I bought a netbook last summer as a traveling laptop. It needed a home to travel within, so I devised a reversible laptop case. Boy print on one side and girl print on the other side. 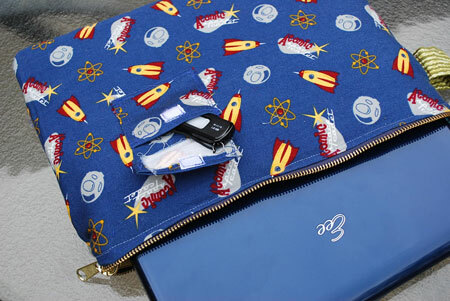 ‘Cause I sure don’t want to carry around a laptop with rockets on it. A ProCare Lining helps keep moisture away from the computer should my waterbottle leak when it’s in my purse. Plus I added a small pocket for a a thumb drive. The Netbook is ready to travel in style. 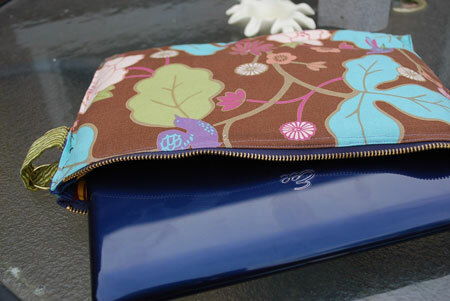 This entry was posted in About and tagged netbook, reversible by Susan. Bookmark the permalink. Love it… are you trying to take my title of reigning Queen of Reversability?? ?